Nail biters anyone? 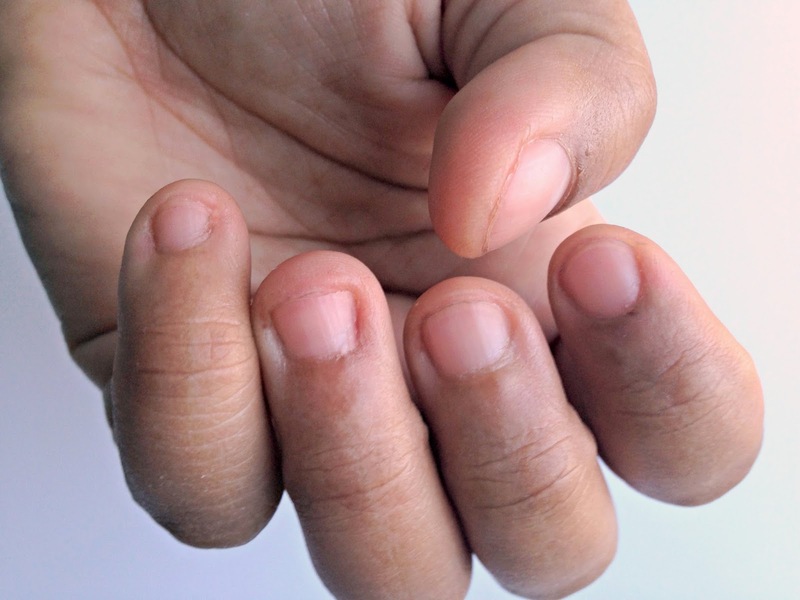 Anyone looking for an alternative to help kick their nail biting addiction? 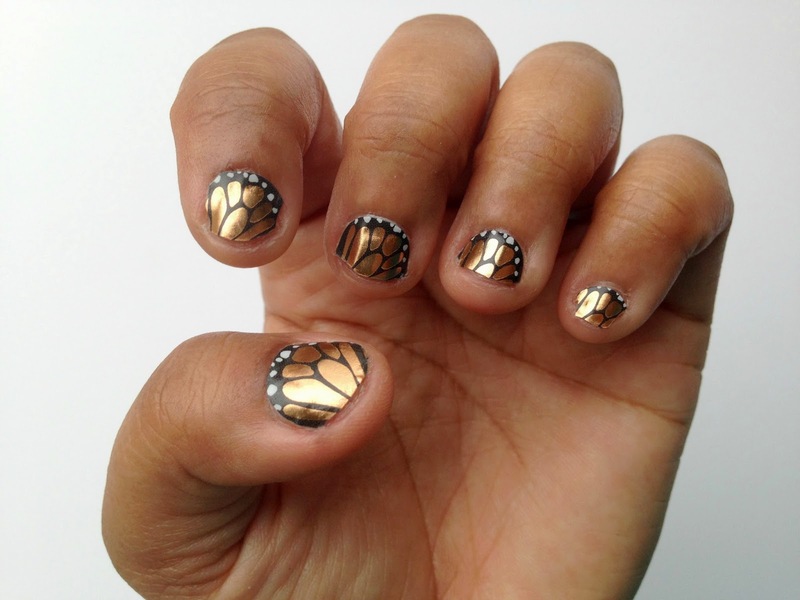 Anyone like the way nail art looks but can't fathom being able to pull it off since you don't have a creative bone in your body? 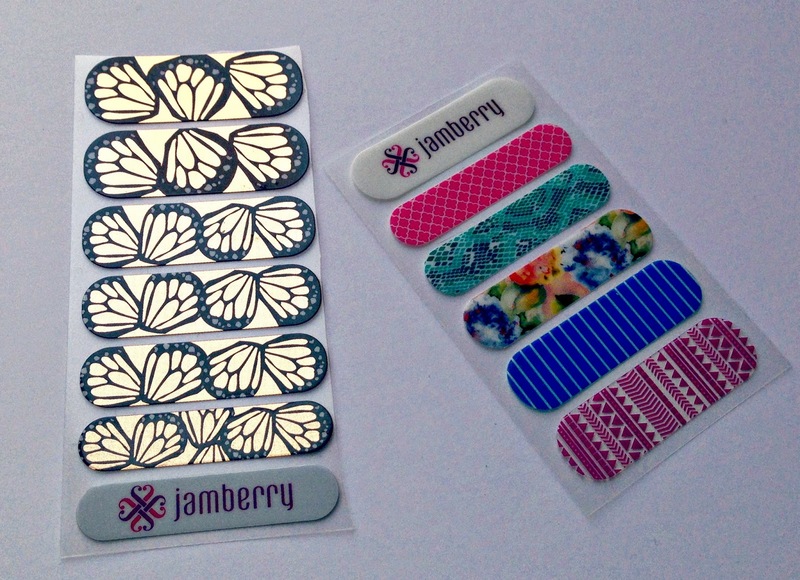 Well Jamberry nail wraps may be the solution for you. Jill rushed me over these gorgeous butterfly wing wraps called Butterfly Effect and some accent pieces. These are amazingly beautiful and I will admit I was super nervous about the application process. If I messed these up I would be so mad at myself. 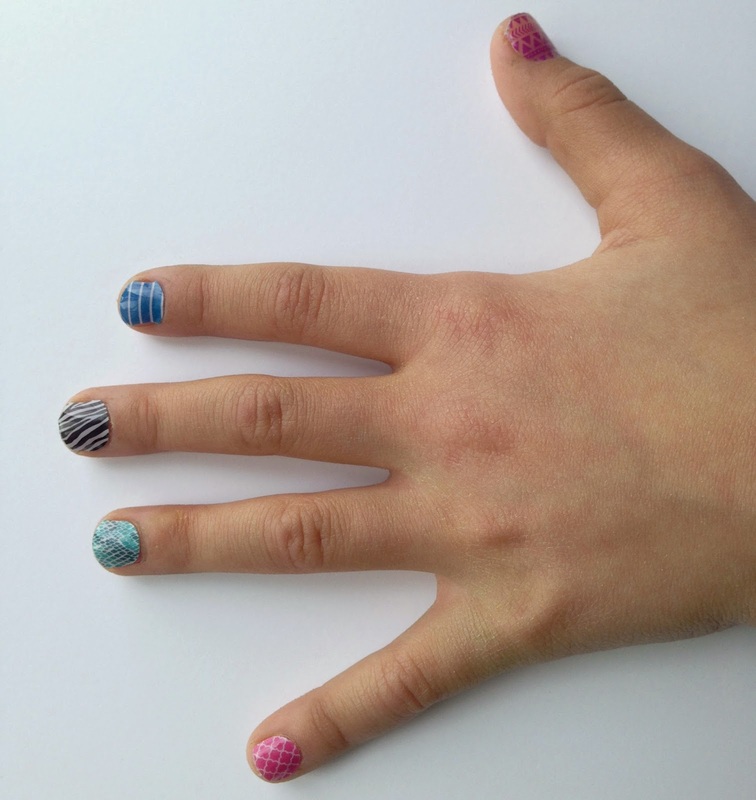 I had never tried nail decals/wraps before because with my tiny nail beds, I never thought they would adhere very well. I read and re-read the instructions carefully and with a bit of patience, pressure, heat, and luck I got them on and they looked AWESOME (for a first timer like me)! I've had them on for a day and so far so good. I think for my next set I will go with the juniors line. This set was a little large for my nails and took more trimming & filing to fit than the juniors would probably take. So are you ready to join me? 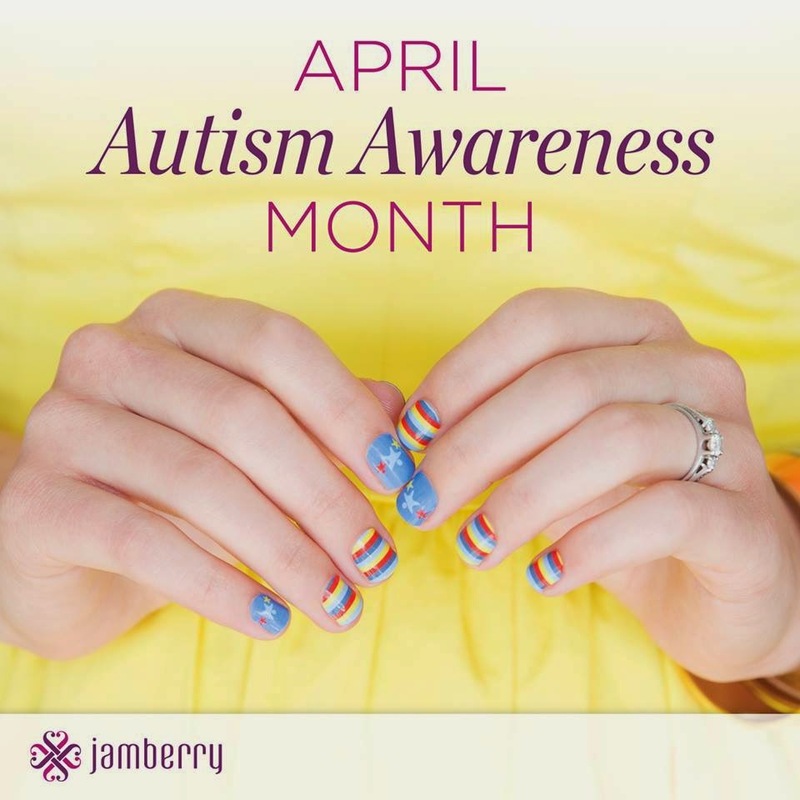 Visit Jill's site to order! There is always a buy 3 get 1 free deal and with over 300 designs to choose from, you're sure to find something that will make your nails look fabulous! I received this product for free from the sponsor. I agreed to use this product and post my opinion on my blog. My opinions do not necessarily reflect the opinions of the sponsor or manufacturer of the product. Anyone on a diet? Anyone looking for a healthy alternative to help kick their soda addiction? Anyone like the idea of drinking water but hate the way water tastes? 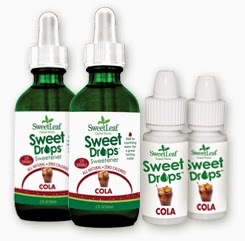 Well SweetLeaf Cola Drops may be the solution for you. I've been on a weight loss mission since January (New Year's resolutions anyone?) and so far I've lost 20 pounds! I still have 30 left to go to reach my goal. A big part of my new regimen was dropping my soda addiction. I started with baby steps by adopting diet soda as a substitute but that quickly was poo pooed by my dieting buddies. I did some research and found the miracle of the Stevia plant. Stevia is a perennial shrub whose leaves are sweet, very sweet in fact. This natural sweetener also has the benefit of being free of carbs & calories! SweetLeaf has also ensured that their manufacturing of this amazing plant based sweetener is free of sugar alcohols, methanol, aspartame and, sucralose. I was excited to be given the opportunity to try out this natural sweetener and for me it did not disappoint. 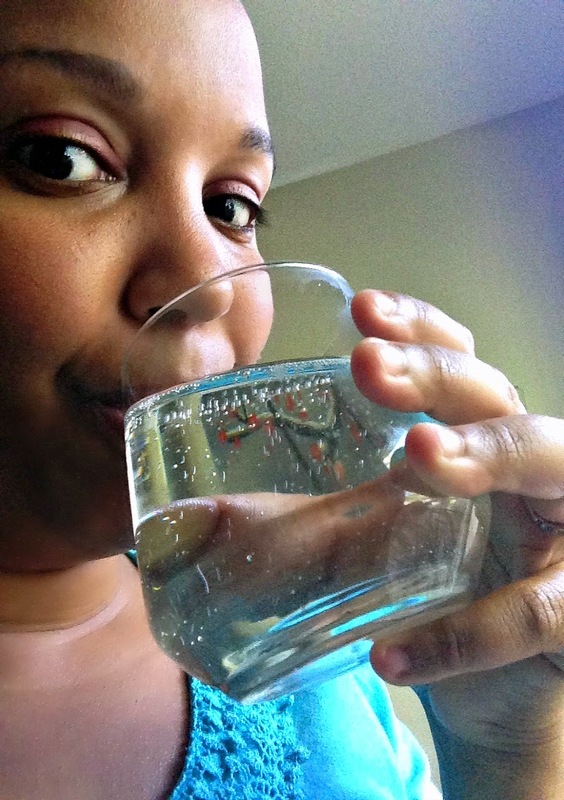 I recently purchased a SodaStream machine to make my own sparkling water and adding the Sweet Drops for flavor couldn't have been easier. They instructed to start with a drop or two and add according to taste preference. I like it sweet so I got to about 10 drops in my 8 oz. glass of water. It gave me the sweetness I crave without all the crummy stuff I no longer want. #winning. So are you ready to join me? Visit SweetLeaf online to order! Use code ColaMD at checkout to take 30% off of your online purchase. Added bonus alert... you'll also get FREE SHIPPING! Oh and get Social With It by connecting with SweetLeaf online to see their latest products and get exclusive access to discounts and special offers.... really what do you have to lose? Well, except those pesky pounds weighing you down. I received this product for free from the sponsor of the Moms Meet program, May Media Group LLC, who received it directly from the manufacturer. As a Moms Meets blogger, I agreed to use this product and post my opinion on my blog. My opinions do not necessarily reflect the opinions of May Media Group LLC or the manufacturer of the product. 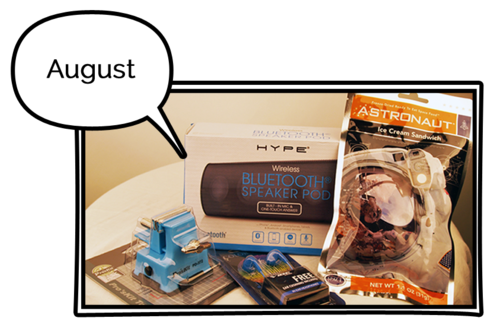 Gizmonthly is a new tech and gadget subscription box. The company promises to scour the world for awesome gizmos (see the correction pronunciation of the business name from this word... dirty birds) & gadgets, wrap them nicely in a box and ship them to you every month. They say you can vote for your favorite and they will ship it to you although it's not very clear on their site on how to do this (maybe social media?). A satisfaction survey is mentioned but I couldn't find it anywhere. They also promise to send extra mystery gadgets to make sure every box is a surprise. I know this process did not happen with the August box, they just sent the box of items. There was no vote on anything in the box so maybe they are planning this new plan with the September box??? I subscribed to this box for Nate. See he's a BIG fan of tech and gadgets and this seemed right up his ally. Boxes start at $19.99 (including shipping) for a monthly plan and can go down to $17.99 with an annual plan. I had Nate signed up for the Birchbox Men's box but that was way too much primping for his liking. Gizmonthly seemed like a good replacement. Nate and our resident junior tech geek Uriyah were so excited to open this box when it arrived that I didn't even get to take unboxing photos! All the photos in this post will be borrowed from the internets. Gizmonthly really took the time to make the packaging of this first box special. The box came with a postcard telling why each item was picked and a call out at the bottom to email/tweet them your thoughts on the box and how you used the items. 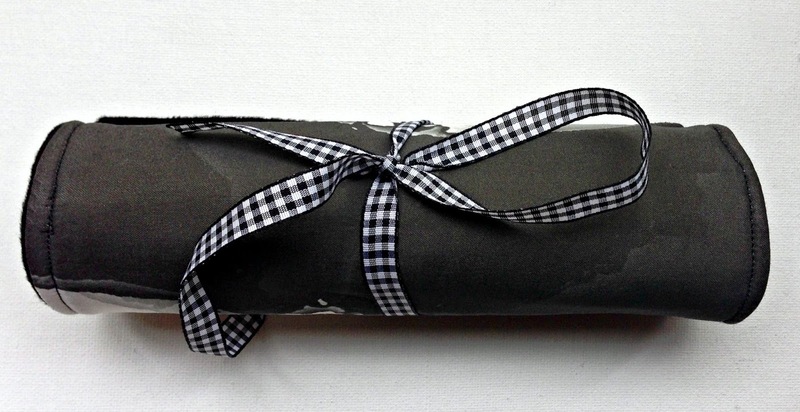 Each item was also wrapped up in blue tissue paper. HYPE Bluetooth Speaker Pod: They sent out the black speaker. It also comes in blue and red. Truth be told Nate was the most excited about this item since he's been contemplating getting a Bluetooth speaker for some time but out of the box the Bluetooth did not work! Tried as we might, we could not get the Bluetooth to connect. 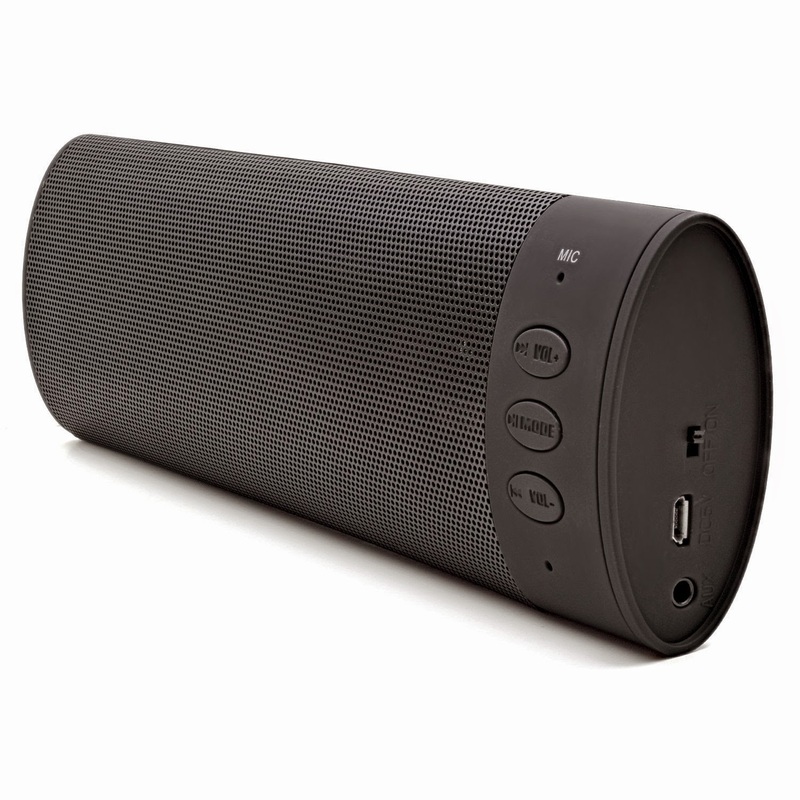 The speaker would only work if it was plugged into a power source. Nate wasn't happy but I emailed the company and they offered to send a new one out (which they had personally tested by the way). We are pleased with their customer service. 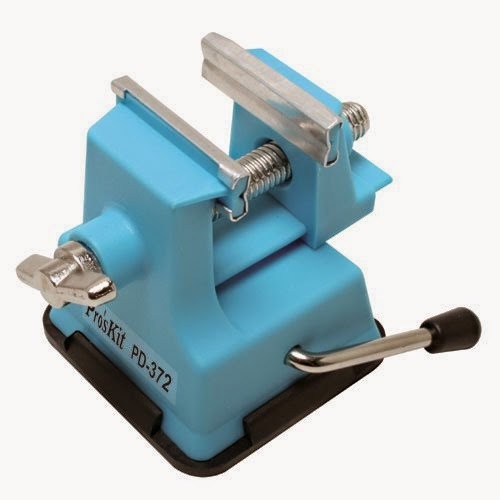 Pro'sKit Mini Vise: This is a cool little tool and Uriyah took to it right away. He found it fun to see what surfaces he could get it to stick to. I'm excited about it because I can see myself using it for my crafting. Nate says he will use it too. An item that pleases 3 out of the 4 people in this house is a winner in my book! This is also an item that I wouldn't think that I would need until I had it in my possession, which is great for a sub box. 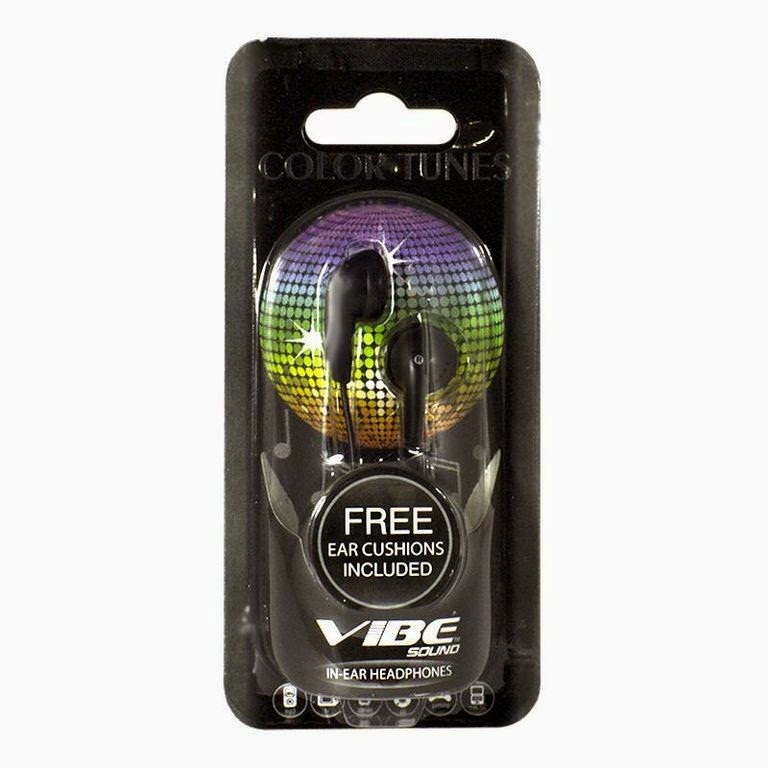 Vibe Sound In-Ear Headphones: We got these in bright blue. To me, just another set of cheap headphones. Uriyah recently destroyed his last pair so these went to him. He likes them well enough and I like that when they get destroyed or lost again (because they will), I won't need to panic. 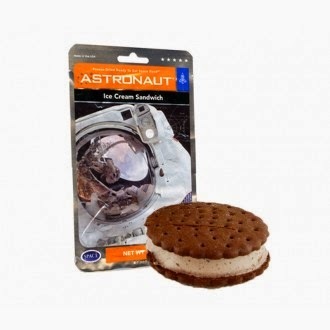 Astronaut Ice Cream Sandwich: True story this used to be what I looked forward to the most when going to the science museum. 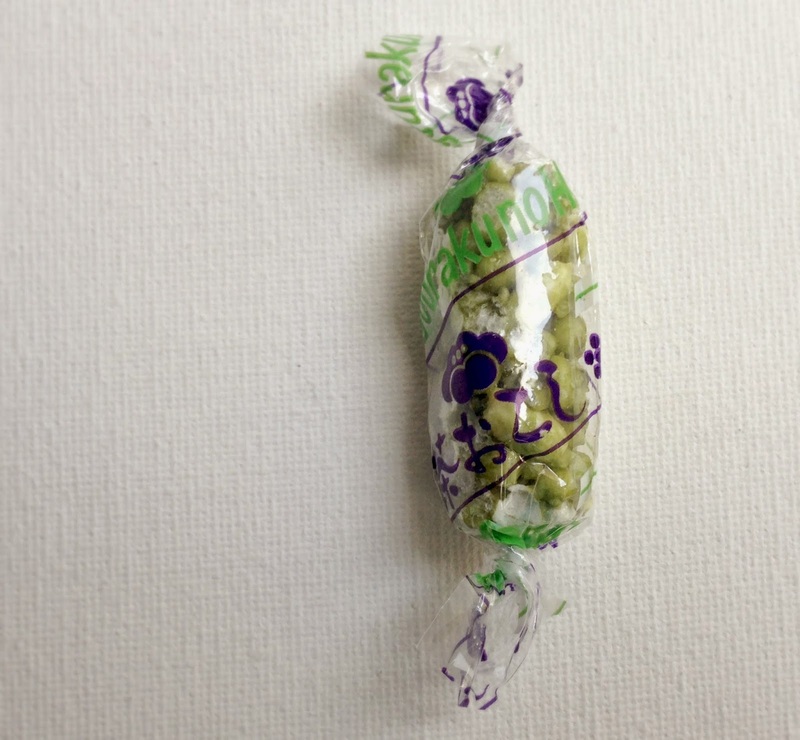 It's not for everyone due to the weird texture but it's a treat that takes me back to my childhood. It was also pretty fun to gauge the kids reactions while eating it. So... with around $30 worth of goods the value is there. However, I really want to be wowed. I was promised awesome gizmos & gadgets and I'm sorry but cheap headphones and freeze dried ice cream ain't it. Here's to hoping they take the feedback they are soliciting and bring on the awesome items in their next box. Nicka K New York Shimmer Eyeliner: I received the blue color. I'm terrified a bit of this. It would definitely have to be the right setting to get this color around my eyes but I guess it could work... Aaliyah did play with it the other day when I let her do dress up and it's cute on her. Still undecided for me though. NYX Butter Gloss: Received the Eclair color. Love this! It's smells and tastes like cake batter. It puts just a hint of pale pink color on my lips and lasts for most of the day. I'm a sucka for lip gloss and this fits right in with my growing collection. OFRA Universal Eyebrow Pencil: This is full size so I'm excited about that but I just don't have a use for an eyebrow pencil. This goes back to my over abundance of hair mentioned earlier. My eyebrows are full and fancy free! This will go into my give-a-way box. I'm starting to think I will do a subscription box give-a-way on the blog of some of the items I've received but won't use. Could be fun no? Realtree for Her Fragrance: So Realtree is a camo pattern company, you know for hunters. They made a fragrance for woman and at first sniff, I'm relieved to find that it doesn't smell like deer pee! (Just a little hunter joke there) It does however smell like lots and lots of flowers and so it's not for me. I'll be passing this along to someone who can appreciate it. So that's June's ipsy bag. Some hits and some misses. Love the bag also this month. It's bold and funky and I'll definitely use it in the future. Disclosure: This blog post contains referral links. 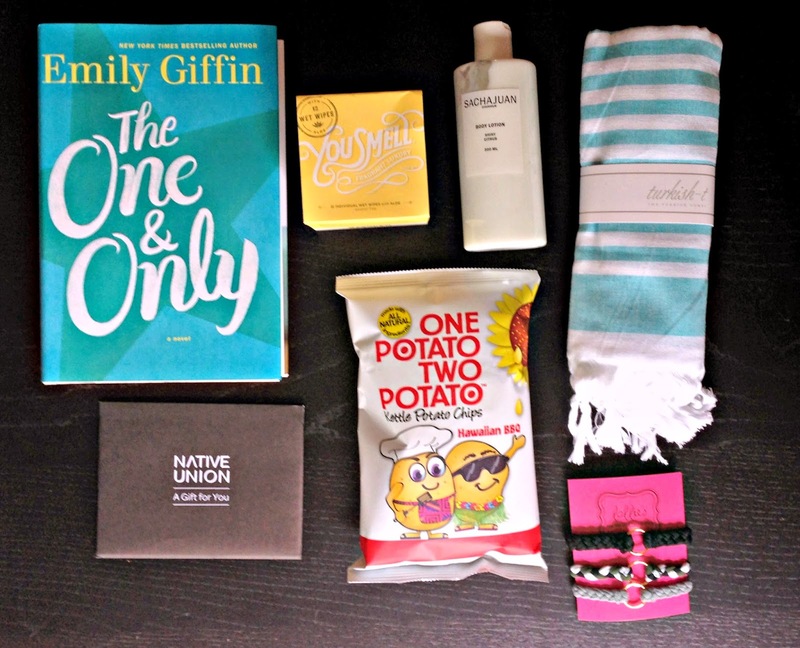 PopSugar Must Have Box is a fun lifestyle box filled with must have items across fashion, beauty, home decor, fitness, and probably a whole bunch of other catagories I can't think of right now. It's the most well rounded box I subscribe to and also the box I most look forward to receiving every month. Boxes always have several full size items and the box value is often $100+. Boxes start at $40/mo. 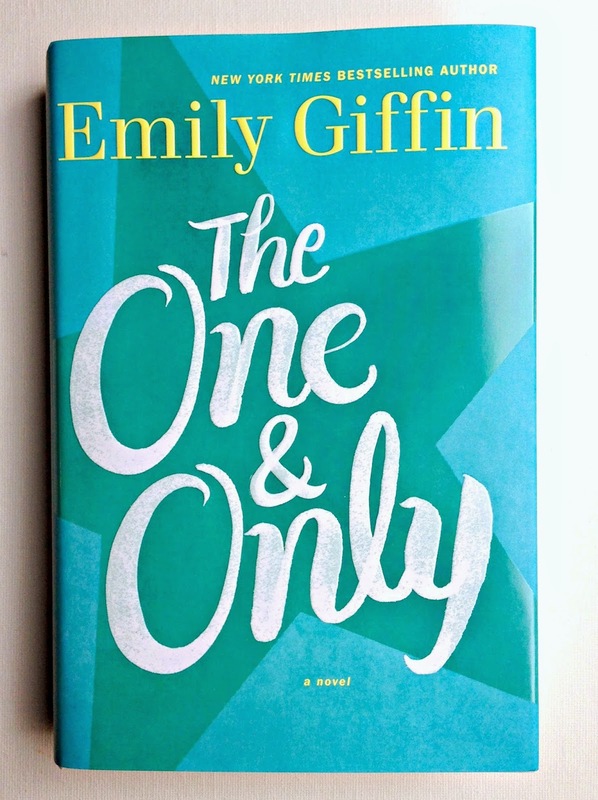 The One & Only by Emily Giffin: Yeah.... I don't like when you pick my books for me! Books to me are a very personal choice. I read the synopsis of this and I'm just like eh. Not really my thing and also I'm obsessed now with reading on my ultra chic Kindle reader. It feels tedious to hold a book now and a hard cover to boot. I'll be passing this off to someone in my circle who will enjoy it. 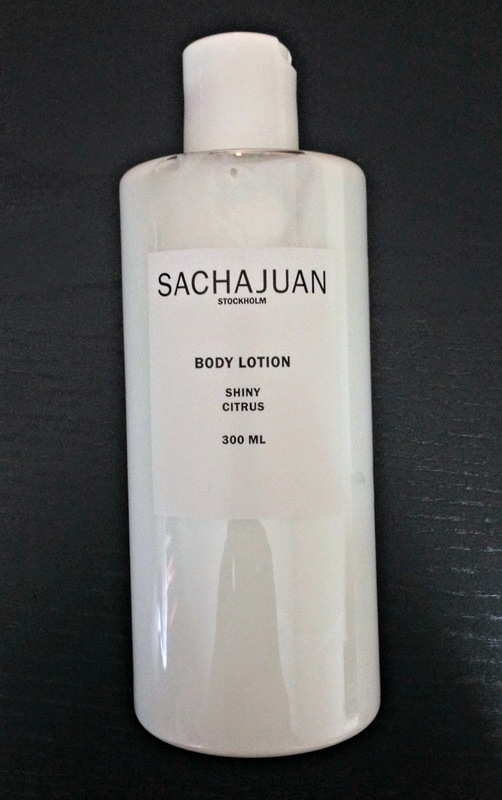 Sachajuan Shiny Citrus Body Lotion: This smells like citrus and is light as air. My extra dry skin needs something a little more thick but I'll add this to my thicker scent free stuff or use as a refresher during the day. It claims to reduce the appearance of wrinkles but really at this point I think anything that moisturizes your skin can claim to do that, duh! 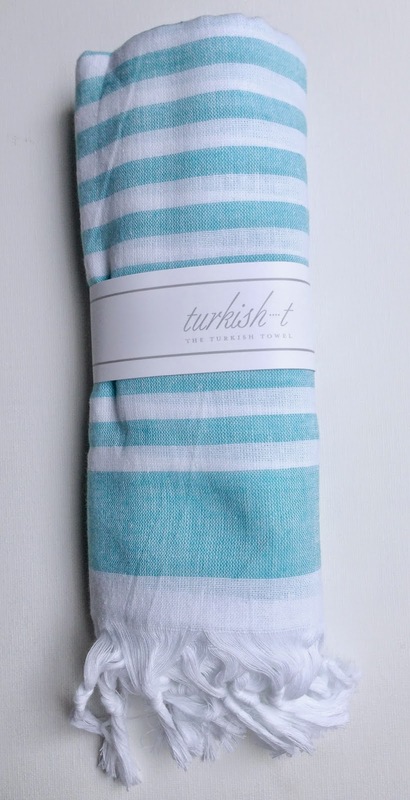 Turkish-T: I'm still on the fence with this towel. It's not really a towel and not really a scarf and not really a wrap... weird. They call it a lightweight beach towel & a glam wrap. I don't know about glam but I'll figure out a way to make it work. It was super scratchy but a Tide wash and Bounce dry later and it's as soft as world's finest cotton should be. 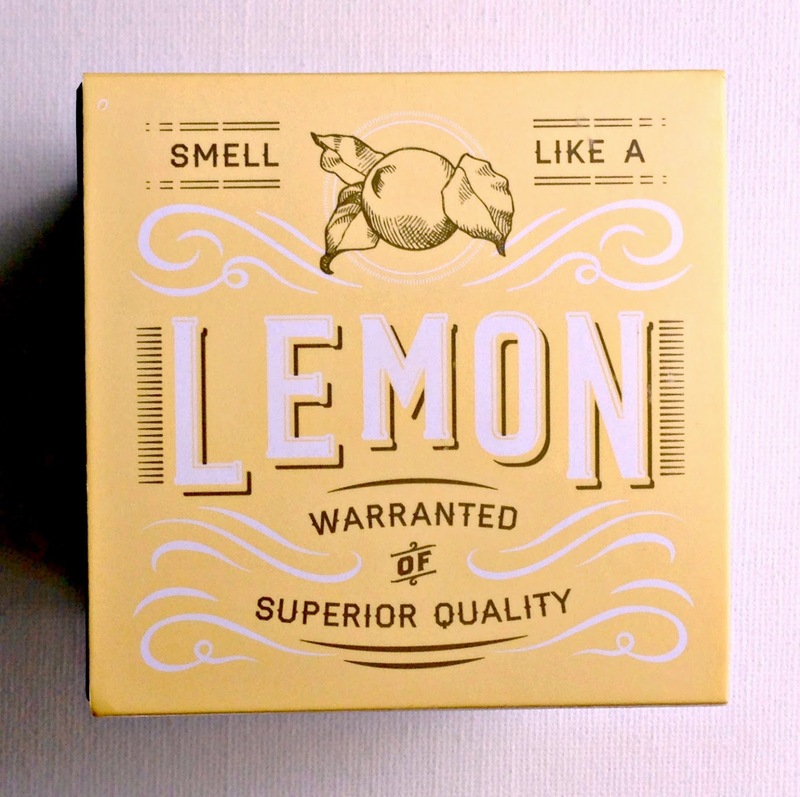 You Smell Lemon Wet Wipes: These smell great. I like citrus aromas and I guess I can get funky every now and then but I don't think I'd use them in that way. I would rather put them in the picnic basket and use them as hand wipes for afterward. 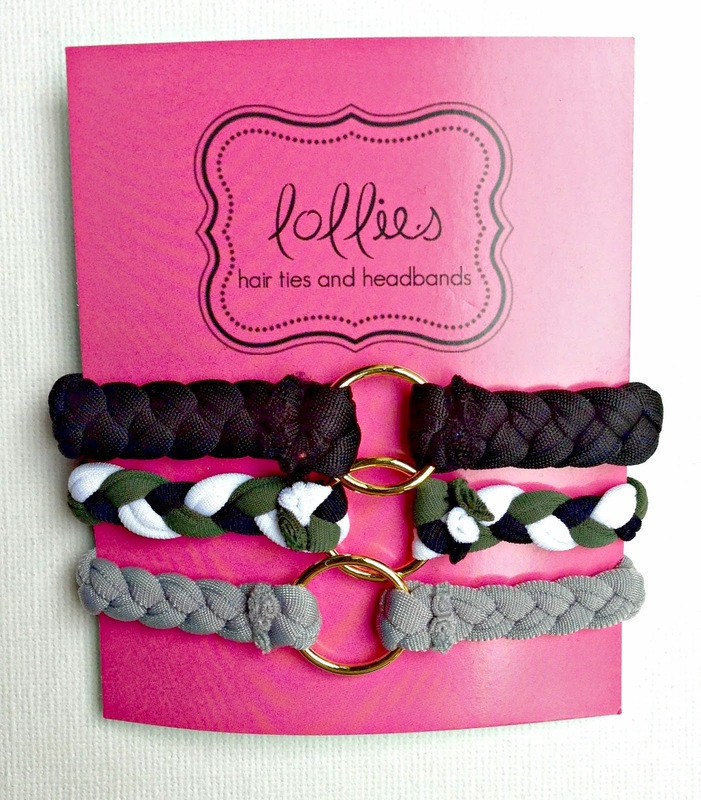 Lollies Basics Hair Ties: Love these! Because of the metal hoop they look amazing as bracelets and because they are thick and stretchy they work great in my hair. I can't tell you how many hair ties I have destroyed trying to gather up my puffy 'ol mess of a mane. I'll be purchasing more right away. 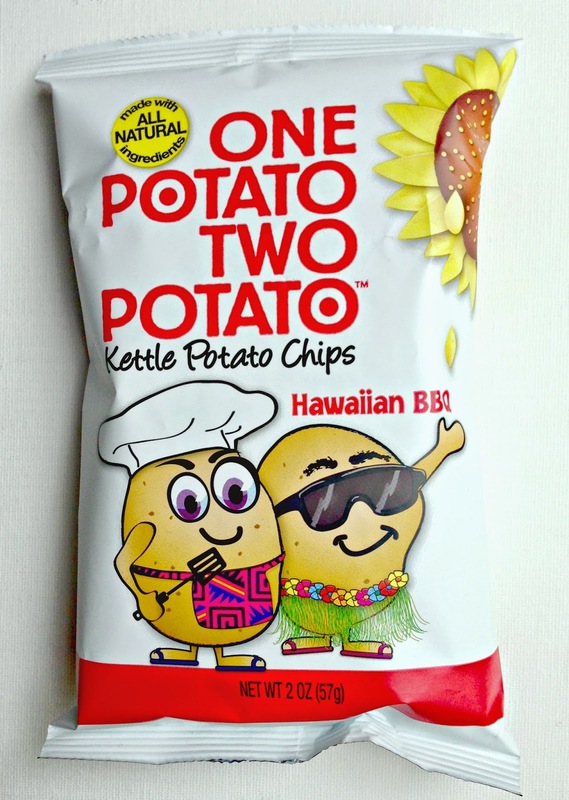 One Potato Two Potato Chips in Hawaiian BBQ: Whoa these are spicy! I was to the bottom of the bag before I knew what happened so these are dangerous as well. I've tried the sweet potato flavor from another box and I think I like these better. 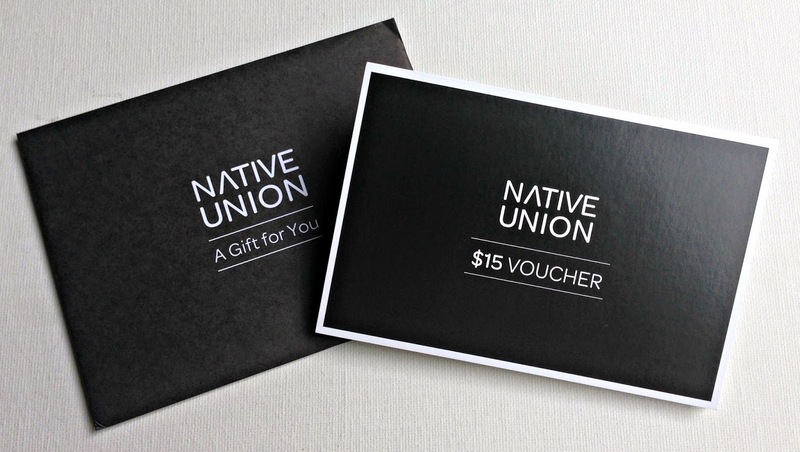 Native Union $15 Gift Card: Oooh finally a gift card I can get behind! I will be using this bad boy to get this. My iPhone is always low on power. I've been looking for a solution for awhile and think this may just be it. They also have some pretty cool phone cases. Have you heard of Influenster? Well if you haven't, Influenster is a community of trendsetters, social media masterminds, and educated consumers who live to give opinions of products and experiences. Part of this includes the VoxBox program where members receive complimentary products to test and review. In exchange, the company asks members to do what they already love to do: share their opinions with their friends & followers on social media. I have been a member of Influenster for a few months and recently qualified for my first VoxBox program: the TLC VoxBox. 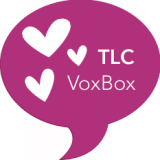 The TLC VoxBox was created for the Moms of Influenster Nation. 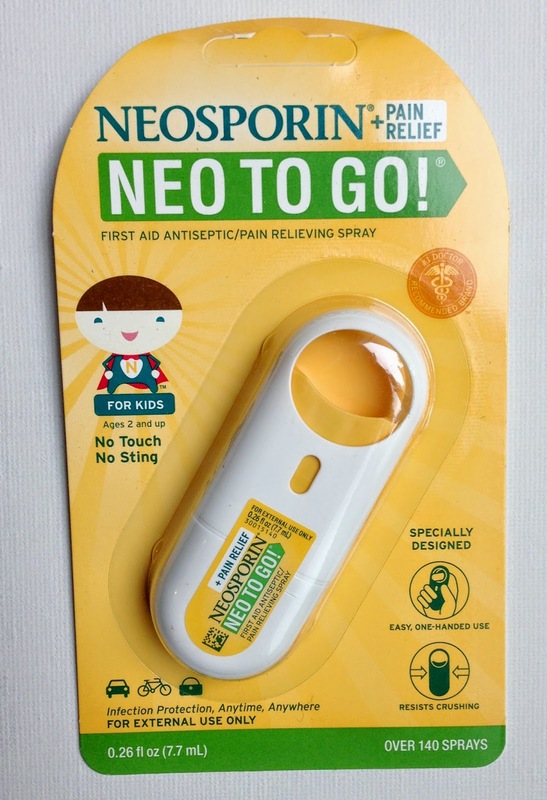 Neosporin Neo To Go! : Call me dumb but I couldn't figure out where the mist was supposed to come out of this. I had taken all the stickers off and was pushing looking for a hole to open up at the bottom when the whole thing fell apart. I got it back together and then realized the hole was in the front... oops! I love Neosporin as a product but this packaging is obviously ackward for me. Would love to see it in a mini spray bottle. With the bumps and bruises my kids rack up this will sure come in handy this summer. 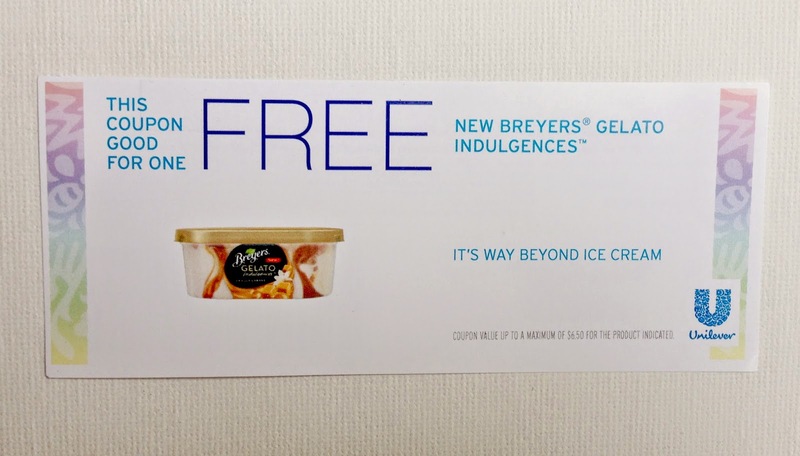 Breyers Gelato Indulgences: I love Breyers ice cream and was very excited to see a freebie coupon for their new gelato line. I used my coupon to get the Raspberry Cheesecake flavor. Ooooh this is soooo gooood! I'm very grateful that I put my first serving into a small bowl or it could have gone downhill quickly. It was extremely hard not to go back for a second and possibly third bowl. This gelato is so smooth and creamy and the fruit and graham crumble puts it over the top. My next grocery trip I will be purchasing some of the other flavors (Tiramisu anyone?). 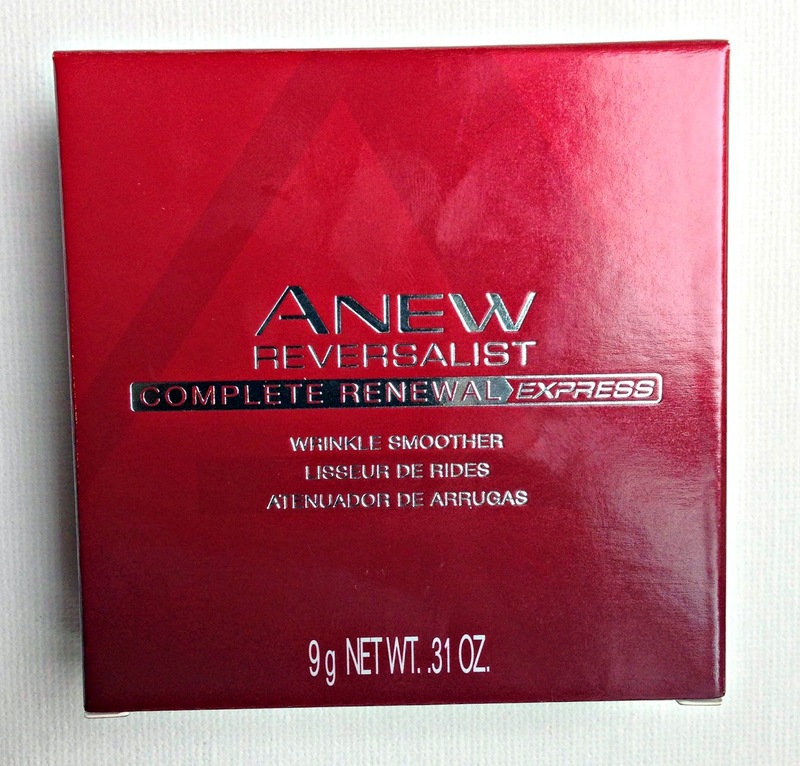 Avon Renew Reversalist Express Wrinkle Smoother: This translucent balm is supposed to blur the look of wrinkles on the forehead and around the eyes INSTANTLY. I followed the directions to a T and low and behold the crows feet on my eyes that showed up shortly after my 29th birthday are still rearing their ugly head (feet??). Also I guess I'm lucky to not have lines on my forehead yet so yea that's a plus! I like the way this compact slides up and the reflective case but.... it's not for me. This will find its way into my give-a-way box. Hopefully whoever gets it will see results. 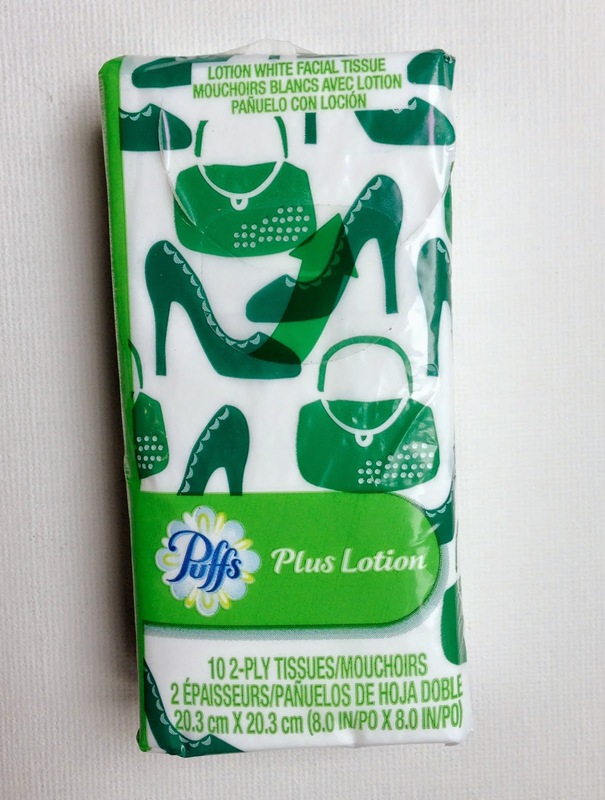 Puffs To Go: Tissues are a must for a mom. I have them stashed everywhere, so much so that I'm always finding half used packages. These will fit in nicely. 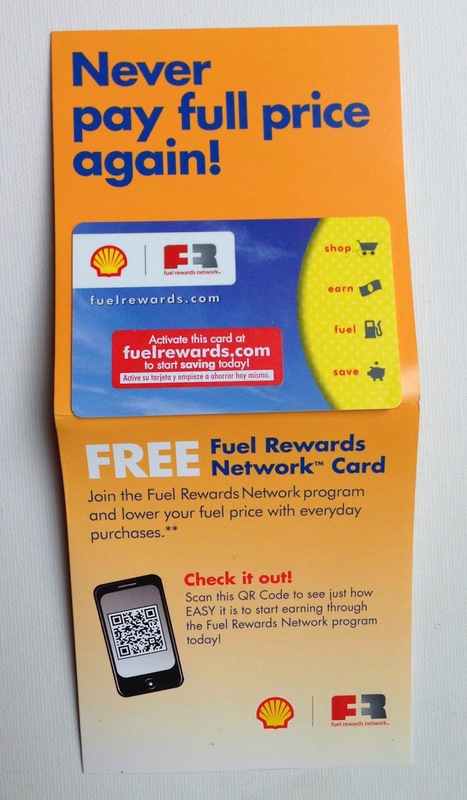 Shell Fuel Rewards Network Card: The Fuel Rewards Network program at Shell is a free loyalty program that helps you save money on fuel. This was a reward card that I didn't have in my collection and who doesn't want to save money on gas? For a limited time, new members save 25 cents per gallon on their second fill up and 3 cents every time after. So that's my box. Just to reiterate I received these products complimentary for testing purposes from Influenster. 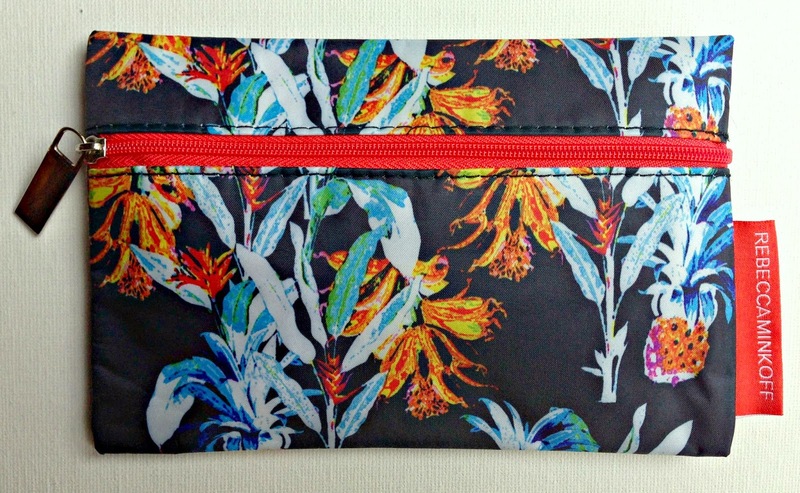 Spoonflower Update: New Textile Design for Sale and Giveaway! A little bit ago I decided to dip my toes into textile design. I found the site Spoonflower, which allowed me to upload my designs and sell them on various textile products including various fabrics, wallpaper & gift-wrap. 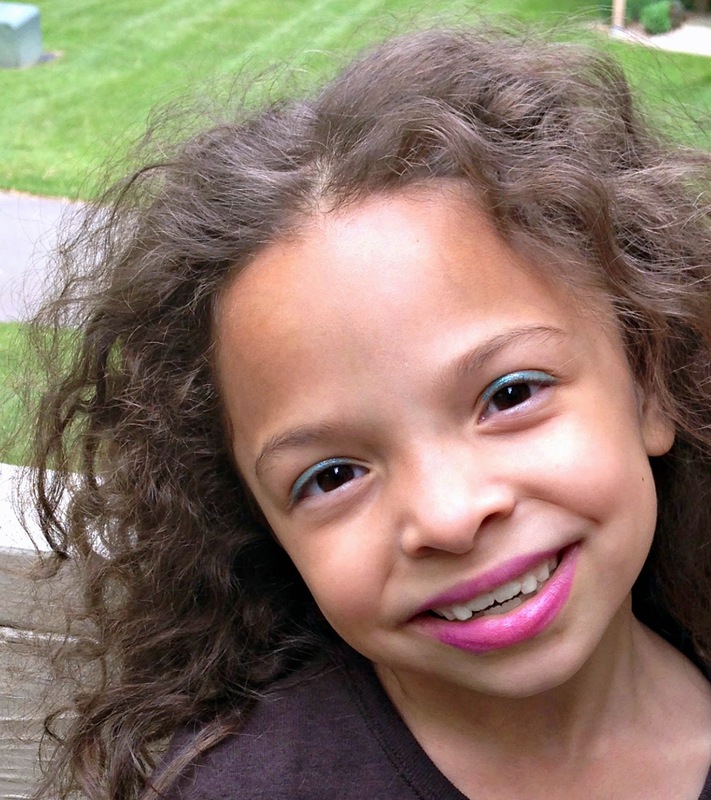 Spoonflower seemed like such a perfect next step for Riyah-Li Designs. I had already entered the graphic design arena with Cafepress & Zazzle and the handcraft arena with Etsy. 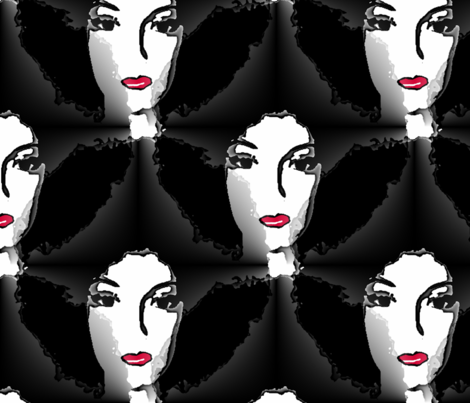 I'm pleased to announce my first for sale textile design with Spoonflower: Afro! Afro is a repeating modern monochrome pattern that gives you the perfect pop of red. It features a fierce diva and I'm so excited to see what gets made from it! 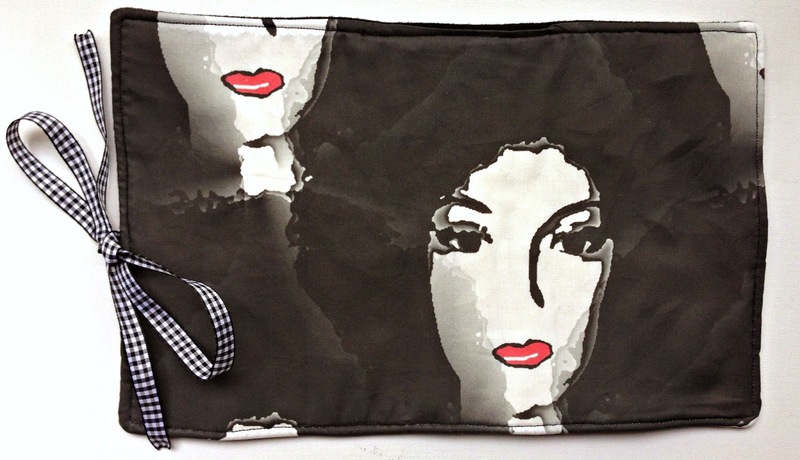 In celebration of launching this design I have made a perfect little item from this great fabric. 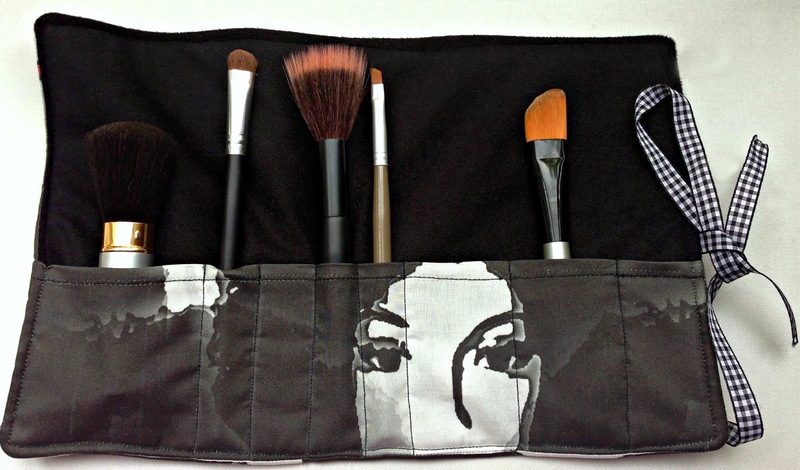 This brush roll is just what any diva needs to keep all her precious make-up brushes safe and protected. Best of all I'm giving it away FREE to one lucky reader!!! This giveaway ends on 6/16/14 at 12am CST so what are you waiting for? Enter already! 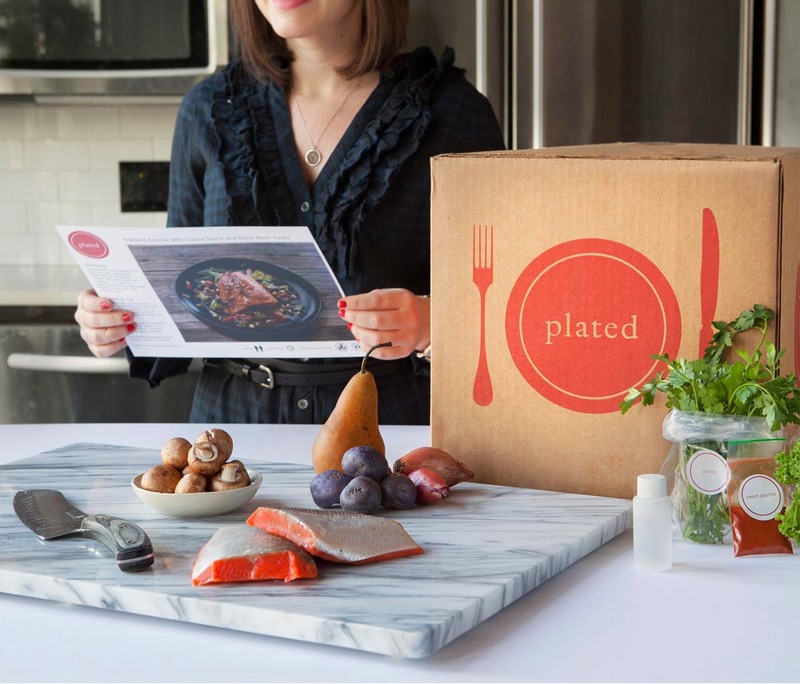 Plated is a weekly meal subscription delivery service that has changed my life! They send you all the ingredients you need to prepare meals that you choose from an assorted mix of 7 options. You can sign up for their membership option which saves you $3 off every meal, or you can just pay as you go. Plated ships via FedEx and delivers twice a week. I have been wanting to try a meal delivery service for awhile but for the most part these services stick to the coastal states. Once I found out this was open to the good 'ol Midwest for delivery I jumped on it. Every Saturday for the past two months we have been getting four to six meals delivered to our door. I must admit the road hasn't always been golden. Many of our boxes have come with issues but the customer service at Plated has been amazing and corrections have been granted swiftly. Thai Chicken Burgers: I was excited about these because I have never had Thai flavors in a burger before. Also I had never made a chicken burger and that was interesting as well. This was really good. I usually stay far away from using fish sauce in a recipe because it tends to overwhelm everything. I wanted this recipe to taste authentic so I used it and it blended so well with all the other ingredients that I'm no longer afraid of fish sauce! The rice was your typical cilantro and lime variety, the star here was the burger. Spaghetti with Meatballs, Pesto & Greens: This was also really good! I loved that this sauce was made from pesto and the meatballs were full of flavor. I think I should have added more salt to the spaghetti water as the noodles were a little bland. The kids even got into this which of course is extremely rare due to the green. White Pizza with Arugula and Balsamic Cherry Tomatoes: Love making our own pizza! Because I'm married to one of the biggest carnivores in history, I brought some sun-dried tomato chicken sausage to add to the mix. Also because this pizza was way too adult I bought ingredients at the store to make a simple pepperoni pizza for the kids. Delicious pizza was had by all! If you are interested in giving Plated a try you can use code 02ffc0 to get 50% off your first order! 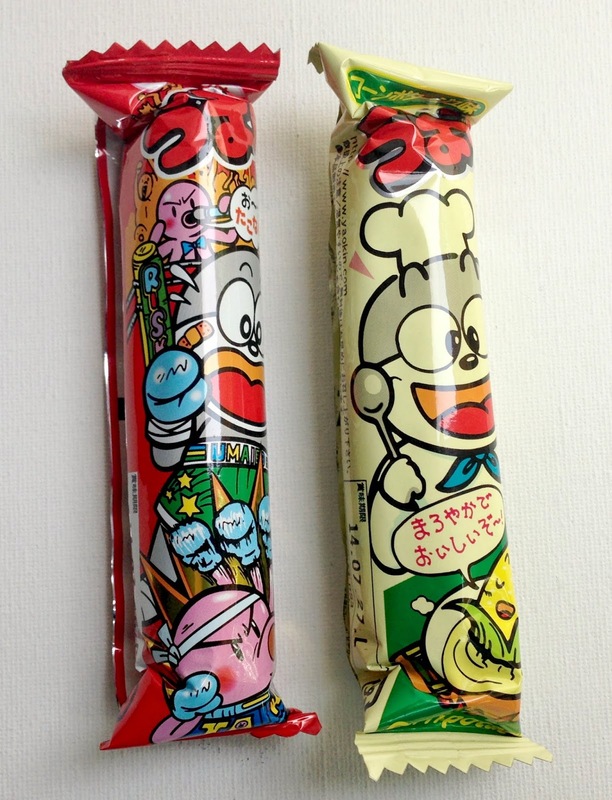 So when I found out that there was a Japanese snack subscription box I gleefully handed over my credit card info. 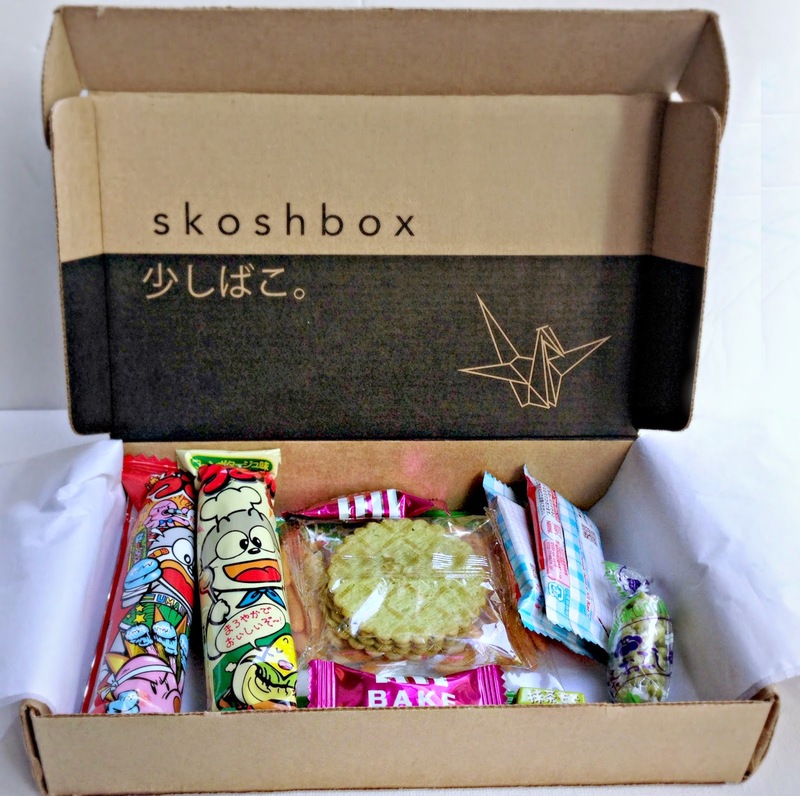 Skoshbox is a monthly subscription box which delivers Japanese candies and snacks right to your door. Matcha Mochi Choco Square: Loved this! 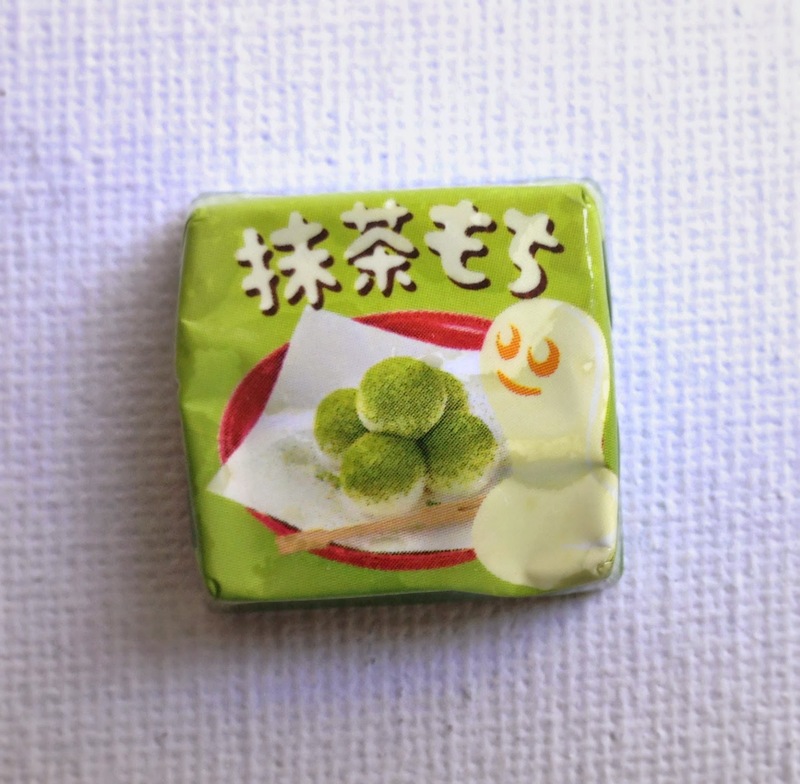 It's green tea flavored with a mochi (gummy) center. Also on a fun note because my kids are way into this box, I was able to split this little square into three teenie tiny pieces... Thank goodness I found these on Ebay so I can get my hands on more. 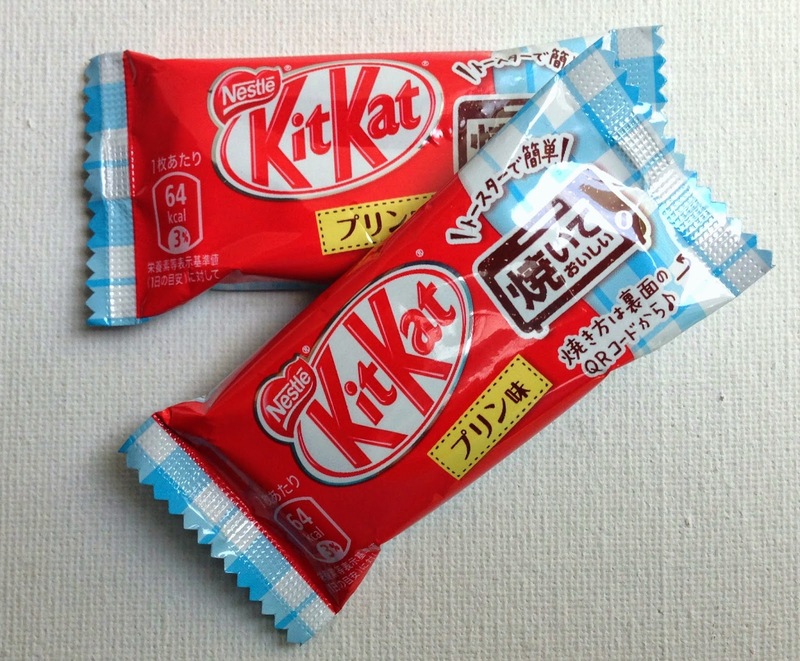 Kit Kat Bake-Pudding: They do fun things with their snacks in Japan and this is a prime example. To fully enjoy this treat you are supposed to broil it for 1-2 minutes until golden. This creates a creme brulee finish. Creme brulee is my absolute favorite dessert and I wish I had patience for that but I just don't. 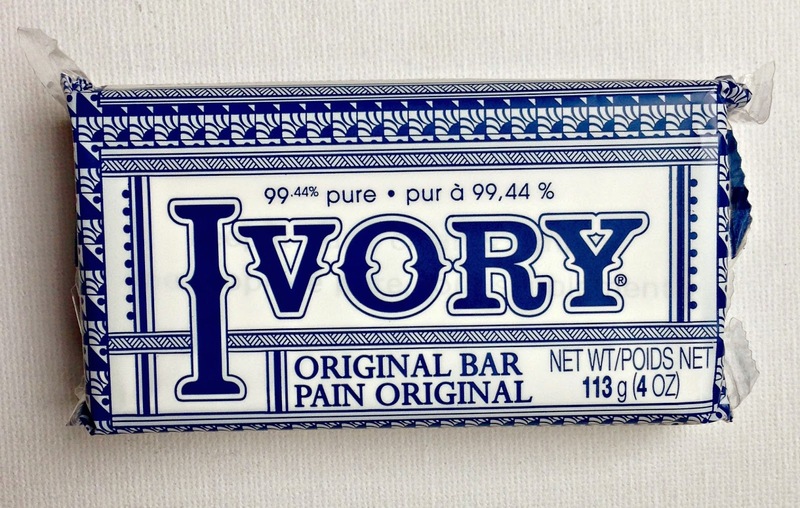 If you don't broil it, these taste just like a white chocolate Kit Kat. 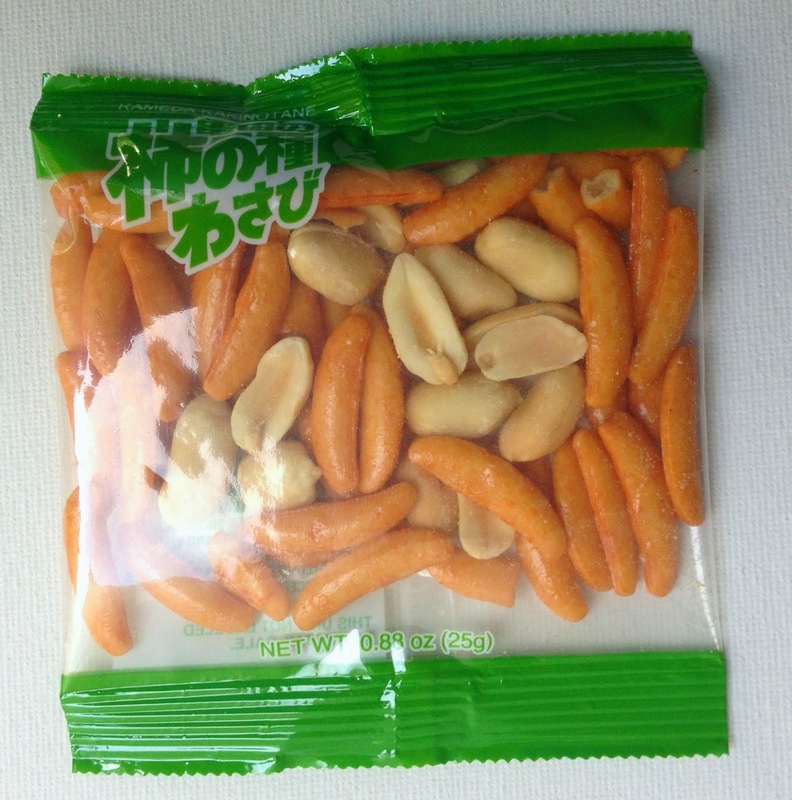 Wasabi Kakinotane: This is a tasty mix of wasabi flavored crackers and peanuts. I love wasabi but for obvious reasons can only take it in small doses. The amount on these is just right. The kids wanted nothing to do with this so I got these babies all to myself.... score! 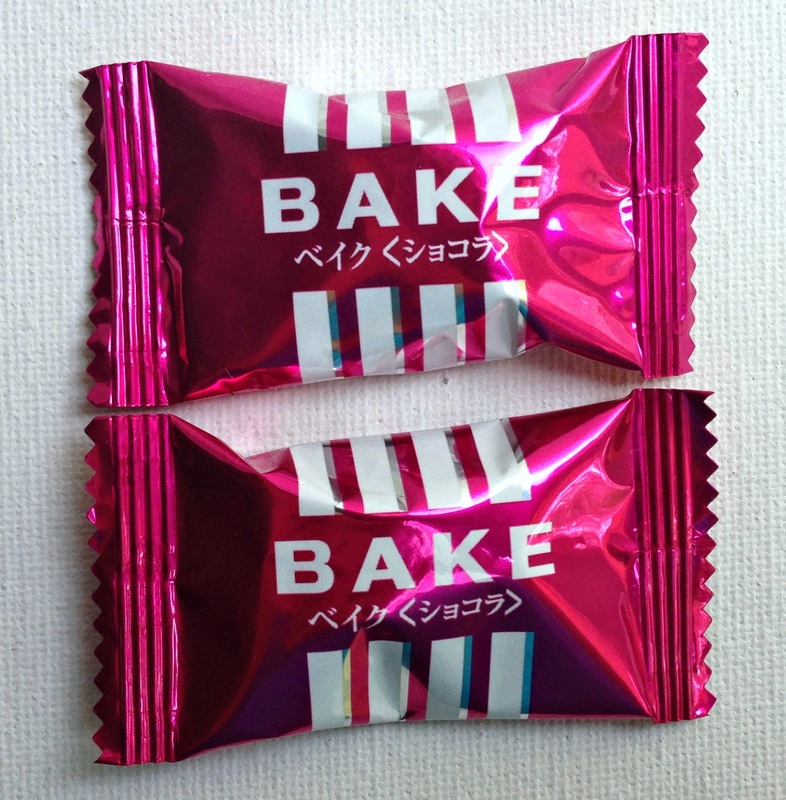 Bake-Choco: Another fun treat. You microwave these for 25-45 seconds and the chocolate filling inside gets all warm and gooey. We did this and for us there wasn't a whole lot of warm gooey filling but Aaliyah is our house chocaholic and she loved them. 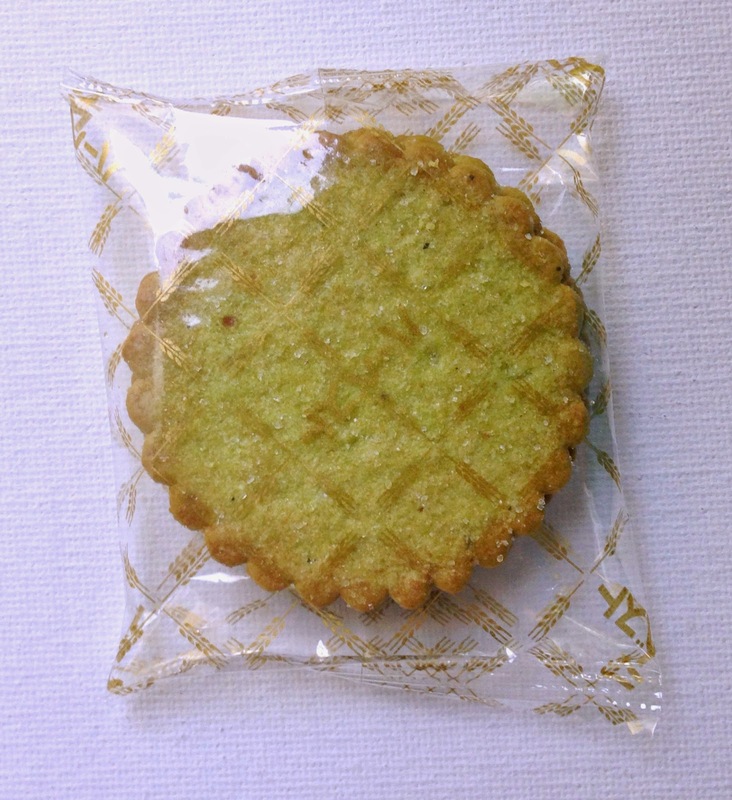 Harvest Green Tea Crackers: These are lovely green tea flavored crackers. They have a strong butter flavor that is awesome. Loved them with my morning coffee. So lots of fun items in this box and a great steal in my opinion. It's the closest I'll get to Japan at the moment and I'll take it!